This publication was created within the project “Support Voluntary Return in the Lublin Region II” co-financed by the European Return Fund and the state budget. 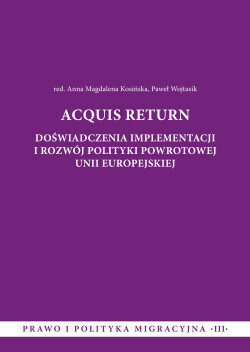 Acquis Return was created by the European Union policy in the field of irregular migration. The Union Acquis Retrun is return policy and law. An important element of “Acquis Return” development is its implementation on national level by the EU Member States and Schengen States. The book contains: information on activities related to the forced return of foreign nationals in selected countries of the European Union, the jurisdiction of the European Court of Human Rights in the field of human rights protection in the Russian Federation, the issues related to the return policy of Norway. We encourage you to read the book.